Your first step is to contact the personal representative, the executor, named in the will. This person is responsible for carrying out the will’s instructions, paying any debts out of the estate, and transferring the remaining assets to the beneficiaries of the will. 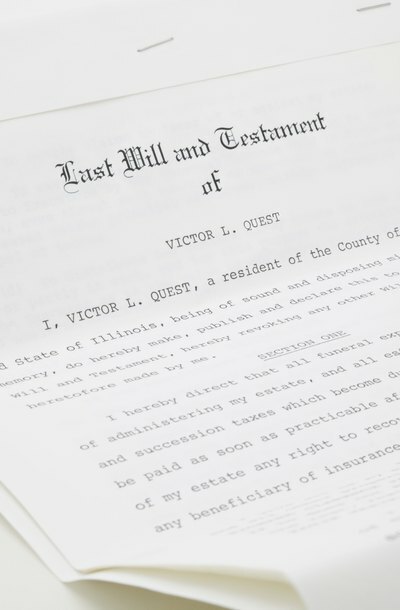 If the personal representative does not have the latest copy of the will -- which may have gone through several revisions -- you must furnish this copy by process server or certified mail, which allows you to prove the date of the will’s delivery to the executor. If the personal representative can’t carry out the task, or if no personal representative is named in the will, you must present the will and a petition for probate to the state court that will be handling the process; this duty is otherwise carried out by the personal representative. You can request that the court appoint you, as your father’s direct heir, as personal representative. If the court agrees to this, it will furnish you with letters of administration, also known as letters testamentary; this is a legal document that allows you to proceed on your father’s behalf to carry out the terms of the will. In the ordinary course of a probated will, the court opens the case, assigns a case number, appoints the personal representative of the estate and issues the letters of administration. The personal representative then takes an oath to faithfully carry out the terms of the will and follow the relevant laws and procedures. The court formally admits the will into probate, as long as it meets the legal guidelines set down by the state for wills. In some states, you or the personal representative must publish a public notice of your father’s death in the newspaper. This legally notifies the public of the death, allowing anyone with claims to the estate to come forward and file their claims with the probate court. When a will is admitted to probate, it becomes public record; creditors have a limited period of time, however, to file any claims against the estate. The final step is to ensure that an inventory of the estate exists or is drawn up. You father may have prepared one already; if not, the court will need a complete list of all his assets including bank accounts, investments, real estate, vehicles, boats, and valuables such as art work, jewelry, collections, antiques, etc. The personal representative named in the will can carry out this task, but in many cases, he will need your assistance, or that of another family member, to ensure the inventory is up-to-date and accurate.